Add Strength & Resistance to your Yoga Workout! Combining flexibility with additional resistance from the Reformer Machine, STRENGTH YOGA (a.k.a. Yoga On Reformer) makes simple yoga moves challenging even for long-practicing yogis! Most people who have been practicing yoga for years may have been using the wrong muscles in their poses. This is because minimum corrections are done in yoga classes as a usual class size can go up to 30 or more practitioners. If you feel that your growth in Yoga has reached a plateau and power yoga/hot yoga/bikram yoga classes no longer trigger adrenaline rush like before, give Strength Yoga a shot! It’s the ideal workout for long-practicing Yoga and Pilates lovers who are looking for a new challenge. Strength Yoga movements are performed against the resistance of a moving Reformer and focuses on “strengthening while stretching” your core muscles. 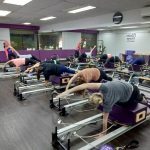 The moving platform of the Reformer machine forces you to use the right muscles to balance the different Yoga poses – if the wrong muscles are used, the machine will not respond to your body movement. Yes, it’s hard to cheat on a Reformer! Strength Yoga is the best yoga for weight loss as it allows you to adjust the resistance level for each exercise according to your fitness level, thereby promoting a higher number of calories burned per class, which leads to weight loss and massive body toning. All classes have a maximum of ten practitioners, which allows our instructor ample individualized attention to instruct and correct each person. As there is no meditation involved, Strength Yoga is suitable for everyone including those without Yoga or Pilates background. You can use your Reformer Group Class credits to attend Strength Yoga classes. Read more testimonials about Strength Yoga™ here. New to Strength Yoga? Sign Up our Strength Yoga™ Trial Class Today! How is Strength Yoga different from regular Yoga? Strength Yoga does not practice any form of meditation techniques. The mind body focus comes from executing every move using the right muscle with control. Strength Yoga involves executing fluid Yoga movements on a dynamic, moving platform to challenge one’s flexibility, core strength and stability. Strength Yoga is yoga for weight loss as it burns more calories due to the resistance from Reformer leading to weight loss and massive body toning. Book My Strength Yoga Class!